Nate Silver, the man who introduced math to political polling, is giving the Republicans a slight edge to control the Senate in 2015. I can see one of two results if that happens: one, we get two more years like the last four of gridlock and political impotence; two, the Loony Wing is ascendant and we see impeachment hearings. In either event, I suspect the party will be short-lived and will end with Hillary Clinton pounding Ted Cruz or Rand Paul in 2016. They are evidently in a race to out-Ted Cruz/Ted Nugent each other. A short history of how corporations came to dominate American politics. 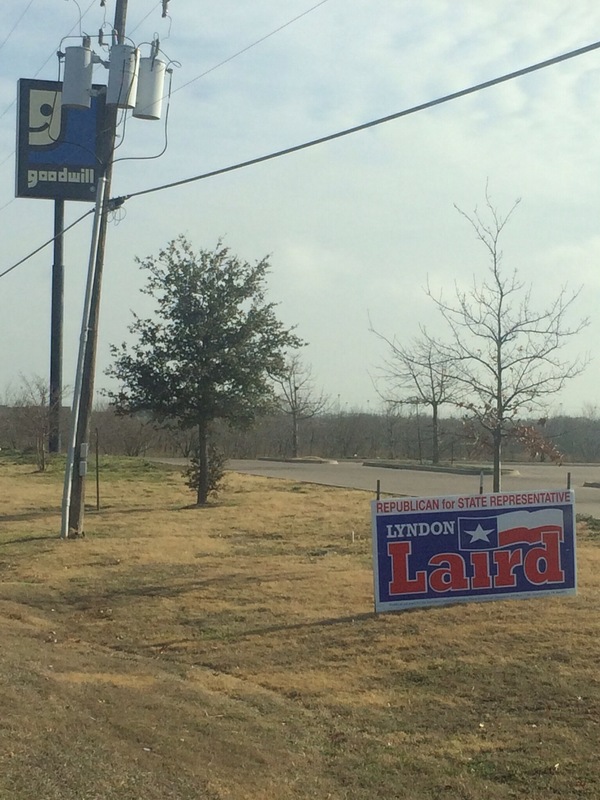 So Lyndon Laird (the accidental Republican candidate for state representative) has a large yard sign right next to the Goodwill Superstore in Burleson. We can therefore conclude that either A) he’s illegally placed a sign on a right of way; or B) he’s illegally placed a yard sign on property belonging to a 501(c)(3) non-profit. Neither would surprise me, nor would it surprise me to learn that Goodwill has no idea it’s there. Even Senate Minority Leader Mitch McConnell (R-Kentucky) hates Ted Cruz (Tea Party-Ontario). This, combined with the incredible unpopularity of Cruz’s kamikaze strategy, indicates to me that’s he’s EXACTLY the sort of bold leadership Republicans need to nominate in 2016. Lyndon Laird is either a “lifelong conservative Republican” who accidentally donated money to Barack Obama and accidentally ran for office as a Democrat or he’s a transparent fraud. You make the call. …Texans happily elect the worst judge in America and a creepy-voiced fanatic who has already pledged to be yet another obstructionist jackass. Now Let The Whining and Blame Throwing Begin!